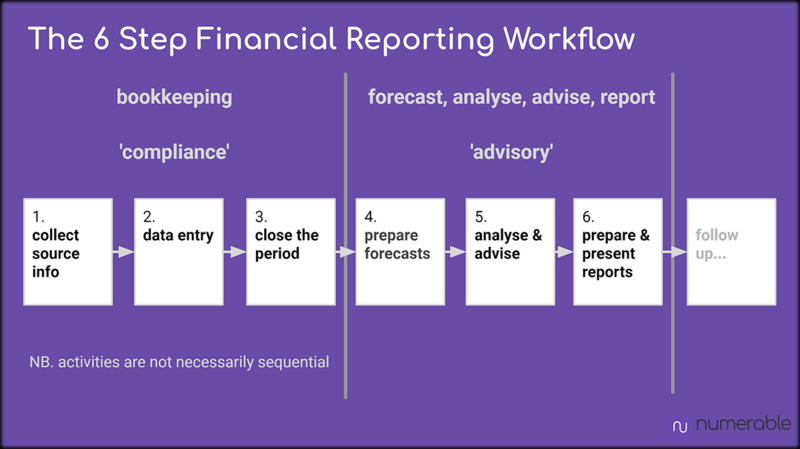 In this series of blogs I’m going to discuss the financial reporting workflow in SMEs (small and medium-sized enterprises). I’m doing so as an entrepreneur, so I’ll be focusing on business issues, not technicalities. I’m not an accountant. But I’ve run quite a few companies and been a non-executive director of others. I’ve spent a lot of time reviewing (and sometimes preparing) financial reports for these companies, both on my own and in Board Meetings. I recognise that the reports are important for decision making, that many directors don’t fully understand them and that accountants often struggle to produce them. My current startup, Numerable Software, aims to make financial reports easier to understand and prepare. So I’ve talked to lots of FDs, CFOs and accountants about how they prepare and present reports. I hope that some of what I learnt may be useful for other entrepreneurs, or even accountants. I found that there are 2 phases in the workflow, each with 3 main activities. The first phase is the bookkeeping; ensuring that records are accurate. Accountants refer to this phase as ‘compliance‘, because it is needed, to comply with regulations. Companies must submit annual accounts to Companies House and Corporation Tax returns to HMRC. If a company is VAT registered it also has to submit a VAT return to HMRC, usually every quarter. That requires accurate accounting records. The second phase converts the accounts into reports that management can use to understand the finances of the business. Forecasts and advice are prepared, adding value to the raw accounting data. Accountants call this phase ‘advisory‘. Many are trying to grow their advisory fees, to compensate for the drop of income from compliance, because a lot of the compliance tasks are becoming automated by software such as Xero. The workflow diagram suggests that the 6 activities are carried out one after the other. In reality this is not the case and they overlap. For example, collection of the source information and data entry are, in most companies, ongoing activities. Some closing activities, such as bank reconciliation, may also be done frequently. But completion of the closing tasks can only be done after the end of the period, which is usually a month or a quarter. For a business with a monthly reporting period, the accountant will typically wait a week or so after the end of the month. This lets them receive (most of) the documents relating to the previous month. They then finalises the data entry and carries out the closing tasks. The monthly board meeting is normally arranged in advance, around the middle of the month. This sets a fixed target date for creating and circulating the financial reports in advance of the board meeting. For example, in a company where I’m a director we had a board meeting on 13th of August. The Financial Controller needed to complete the financial reports, ready for circulation, by 10th. This tight timetable created pressure to quickly close the July accounts. There was limited time to do thorough forecasting, analysis and report preparation. The compliance tasks are ‘must do’; they are essential. The advisory activities, on the other hand, are viewed differently, as ‘nice to have’. The accountant can only move on to the advisory phase after the 3 activities of the compliance phase have been correctly completed. As time the date of the board meeting approaches and the period’s accounts have not yet been closed, the time available for the advisory activities gets squeezed. They are often carried out in a rush and parts may not be done at all. Some kind of forecast is usually prepared. But the ‘analyse and advise’ activities may not be carried out thoroughly and the reports that are prepared can be very basic. This time pressure is just one reason that financial reports are often not presented to directors with helpful advice, or in a form the directors can readily understand. Innovative software tools can help overcome these challenges, and that is what we are working on at Numerable https://www.numerable.io/. In my next blog I will examine in more detail the 3 activities of the compliance phase, and highlight particular problems that can occur.